Didn’t want the weekend to come around without having one more study of rocks to post. 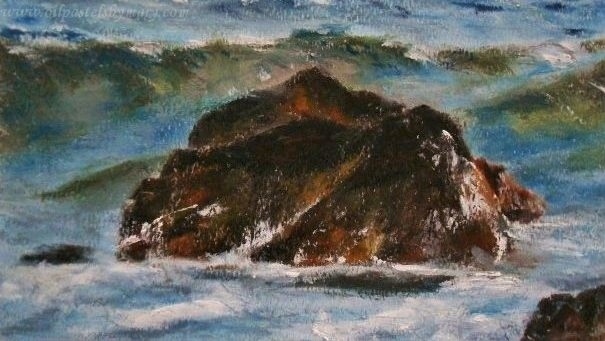 The Rock (4×6) is a small oil pastel study of a rock sitting close to the shore along the coast of Maine. This study is all about the rock w/regard to color, formation and textures – the water is more incidental to seat the rock. Thanks for checking in, have a great weekend! This entry was posted in Challenges: Subject Matter Studies, OPs New Paintings, Rocks/Boulders and tagged ocean, Oil Pastel, painting, rock, study, water. Bookmark the permalink. The rock is wonderful. I love the water. You caught the reflective quality it has. Thanks, reflective light is exactly what I was after – thanks! I love when you do a small size painting…they seem so precious. Thank you Laurie – means a lot. I don’t know if it’s good or bad to paint such small studies, but they are great teaching tools. You’ve given the rock its due elegance. Thank you Frank – I’m finding rocks are the challenge! Working on my 5th, it’s a touch exercise. Thank you Eva for your lovely comments! You’re quite welcome. You deserve each and every one!! Thank you for the well wishes Susan – the weekend was way too busy, but restful as well! Thank you for your nice feedback on the water and rock! Love this one Mary. The colors in the water are rich and full of light. The rock is so wonderfully dimensional. Awesome. Thank you Rhonda, loved reading your thoughts on this one! Wooohooo! That rock looks positively dangerous! You are doing an excellent job of depicting all the jagged edges and color gradations of a prominent rock formation near shore. The darkened wave tips do not confuse my eyes as per “mrsmrs says”, in contrary it just suggests to me that there are other rocks under the water mass, that is why is darker at that point and that is why the waves breaking over it! OK, there you have my humble opinion over the “confusion”. The rock is the focal point and love the values and texture of it, beautiful visuals! Wish you a wonderful, happy weekend as well! I enjoy your descriptive interpretations as much as the beautiful visuals Mary. Want a totally ignorant comment ? – you gonna get it, anyway; and advance apologies for it. The darkened wave tips confuse my eye. At first I thought I was looking at a volcano ! The thing is that someone who knows zero about art tends to look at it with seen memories in mind rather than without anything influencing the eyeball. Alas. M.R. I hope you would comment! I can totally understand why you thought it was a volcano, without the water being sparkling blue and a natural nuance about it the rock looks something other than what it is. This is one of the problems I struggle with doing studies of close-up rocks and boulders – I’d prefer to have no background, but often they read better with a background to seat the subject. I get your meaning – thanks! I completely forgot to respond – ha! Oh M.R. you didn’t say anything wrong in the least, not being familiar with the scene you really looked at the painting to try and figure out what the heck did she paint this time (lol)! Thank you for speaking your mind, why you wouldn’t be M.R. if you didn’t – so don’t stop, be who you are. I love rocks, all shapes and sizes, and goodness knows, there are plenty of them in Maine. 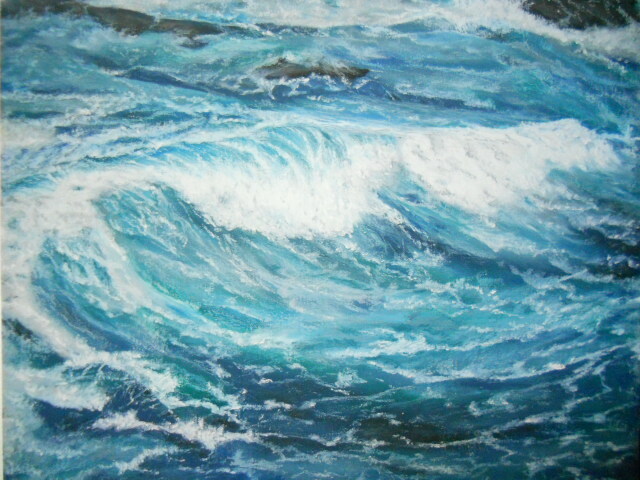 Thanks Lulu, this one was wonderful to paint – but the water could have been more advanced. You are right about Maine rocks – I have a unique one that we had on our cove which I’ll be painting. You are really good Marina! Was working in the yard and just saw your note, ask me where my mind is? Thanks so much for the reminder! Thank you for your feedback on the rocks – it was great fun to paint, yeah the wave is coming just not in this scene – but I do have it where it slammed into this rock! So glad it’s the weekend, have a good one!